than the voice of Adonai inviting us? God shows us the way of life! R/. so now and evermore. Amen. R/. All may sing or alternate the verses of any Morning Hymn. 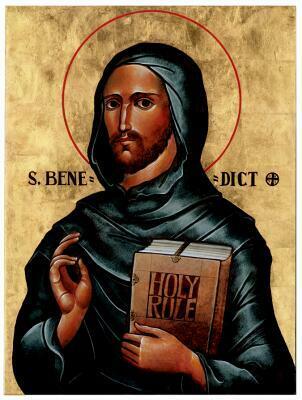 The following is for St. Benedict. Has shown his countless children here, the paths of peace and God’s own ways. For him, the love of Christ was all And God was present everywhere. Unmoved among the things that change, He sought and found a lasting peace. In glory clothed he lives again And we rejoice with him today. Gives praise to you, blest Trinity, In splendid light and time untold. Amen. who even from the days of his youth bore within him a mature heart. In his ways transcending his years he resolved to prefer nothing to Christ. Alleluia! And may he bring us all to everlasting life. In our God my soul shall makes its boast! The humble shall hear and be glad. This poor one called Adonai replied—rescued me from all my distress. God’s angel surrounds all those who call, to save them from all they fear. O taste and see Adonai is good! They are happy who trust in this Love. Revere Adonai all you who are holy. They lack nothing who trust in God’s name. Though lions may hunger and find no prey, those who seek God are not disappointed. Do you long for freedom and fullness of life–many days to flourish with joy? Turn from evil, do good for others; you must seek and strive after peace. The face of Love turns away from evil that such deeds be remembered no more. The just call, Adonai hears, rescues them from all their distress. A guard to keep watch over all of their bones so that none of their bones will be broken. Adonai is close to the broken-hearted; those who spirit is crushed will be saved. Adonai ransoms the souls of the poor: those who trust shall not be condemned. and equity, every good path. Let the multitude of all the faithful rejoice for the glory of the loving Abbot, Benedict. Let the company of monastics especially be joyful, celebrating on earth the solemnity of him in whose fellowship the saints rejoice in heaven. Alleluia! ~bless all those who seek you in the monastic way of life. deepen our sense of your presence and love at every moment of the day and in all of creation. Benedict was blessed with a vision of the whole of creation contained in a single ray of sunlight, ~bless us with a profound awareness of the unity of creation and of our small but important part in it. Benedict taught that all the objects we use should be respected as vessels of the altar; ~teach us to treat everything with reverence and care. Benedict died surrounded by his brothers, with his hands uplifted in prayer, ~bless us with the grace of a peaceful death, and bring to eternal life those who have died. Holy One and God of endless Compassion, you are the praise of all your saints and the joy of all creation. You called St. Benedict to share his wisdom in a simple and balanced rule for communities dedicated to contemplative prayer and sustainable living. You call each of us to devote ourselves to prayer and works of compassion and love. May our hearts and our lives be in harmony with the words that we pray and our whole lives help to build your reign on Earth as it is in heaven where you live and love One God for ever and ever. Amen.